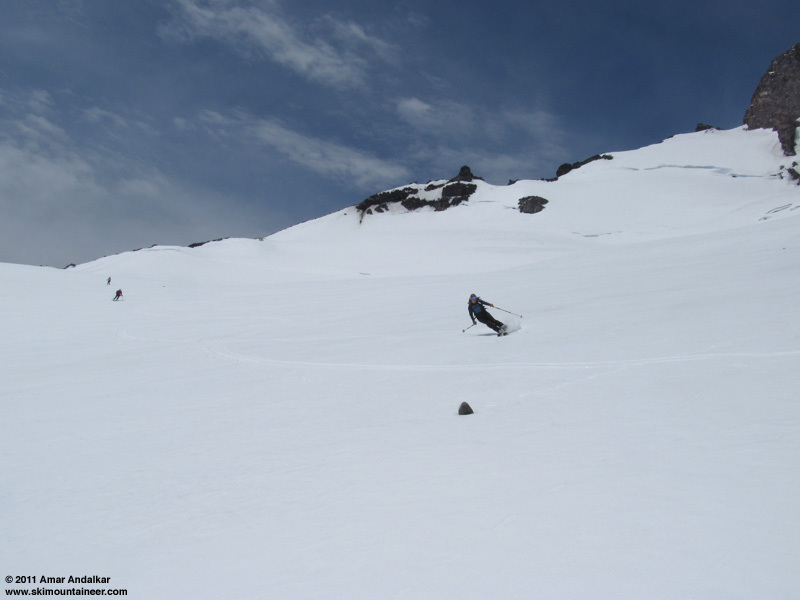 Summary: Planned to ski the Turtle Snowfield from 11600 ft Camp Hazard. 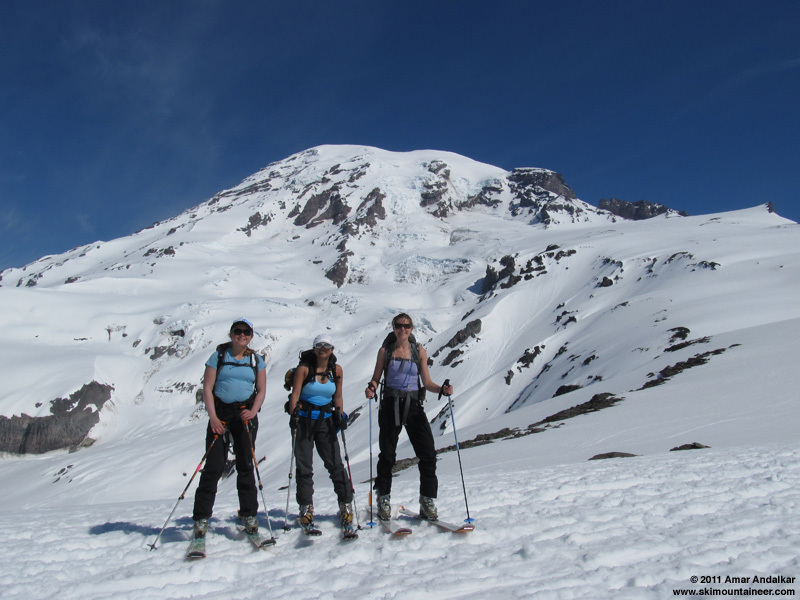 Changed our minds at 6400 ft Glacier Vista just before dropping down to the Nisqually Glacier, and decided to ski Cowlitz Glacier instead via Camp Muir. 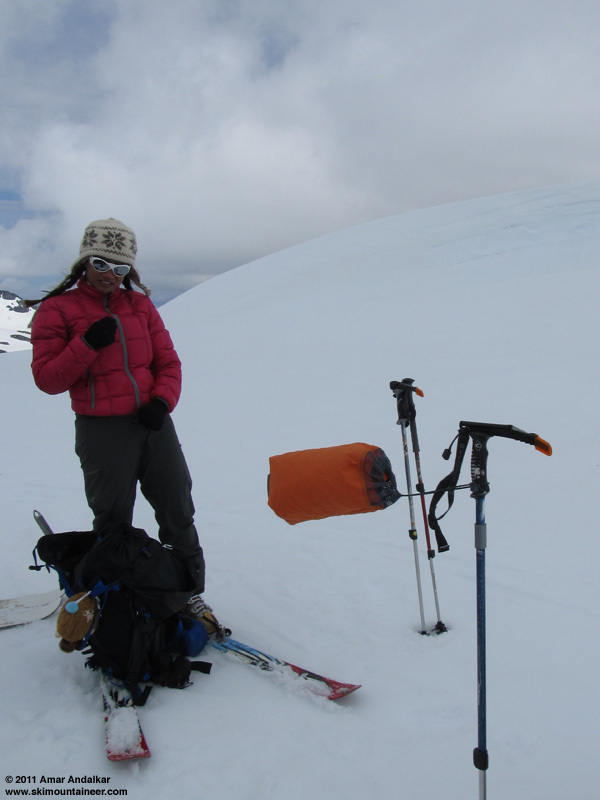 The Cowlitz had excellent smooth near-perfect corn snow from 10000 ft down to 8500 ft, with softer but still fine snow down to 7000 ft, and then increasingly stickier snow down to 6300 ft on the medial moraine at the spectacular Cowlitz-Ingraham Glacier junction. Crevasses are becoming a serious issue, and cautious routefinding is essential: ominous sags are developing and incipient cracks are opening near 9500 and 9000 ft on the Cowlitz, while a very long crevasse near 8000 ft extends perhaps a half-mile long across the Cowlitz and Paradise Glaciers -- this one must be crossed via a broad snowbridge to ski the route we skied. 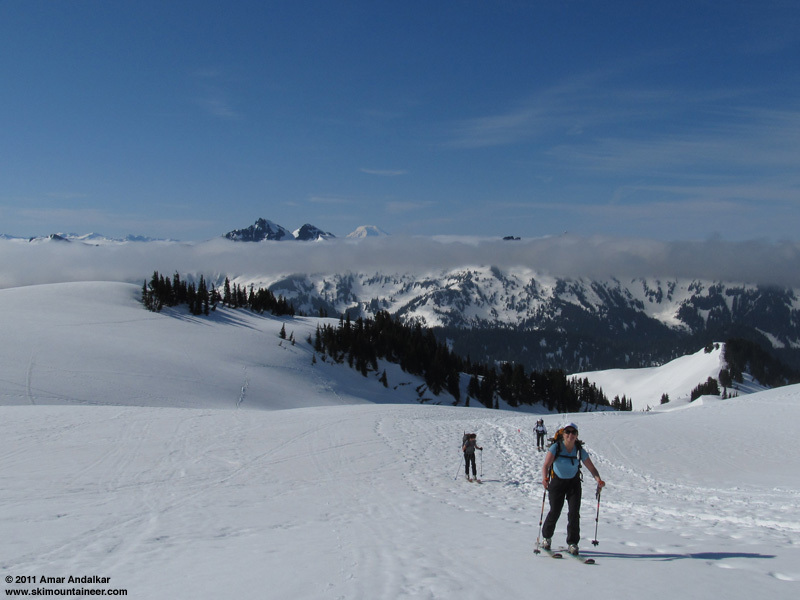 From the Cowlitz-Ingraham Glacier junction, we skinned back up to 7100 ft Cowlitz Rocks saddle and returned to Paradise on the long traverse via Golden Gate, no skinning needed in the mushy snow. A beautiful day of skiing in the sunshine and then escaping just minutes before the rain began, outstanding! Two-shot panorama from the medial moraine of the Cowlitz-Ingraham Glaciers near 6300 ft, showing (left to right) Anvil Rock, Cowlitz Glacier, the cliffy buttress at the end of Cathedral Rocks ridge, Ingraham Glacier, Little Tahoma, and Point 8908. Details: The Rainier forecast for Sunday looked very nice: mostly sunny, freezing level 9000 ft, winds under 10 mph at Muir and under 20 mph at the summit. 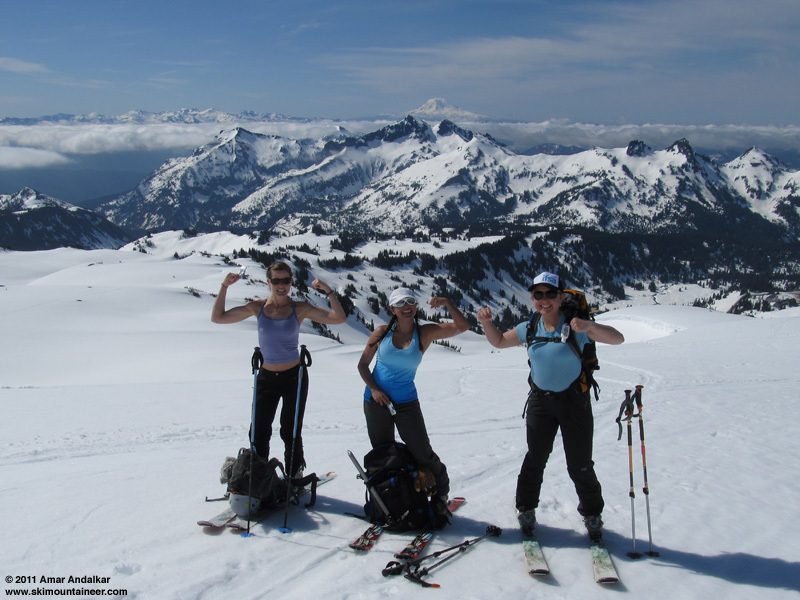 About 3 hours on the phone Saturday with Khanh, Stephanie, and Jessie discussing various bigger options (overnight summit push via DC to ski Kautz Glacier, or Little Tahoma via Fryingpan Glacier) resulted in a more moderate plan to ski the Turtle Snowfield, still a 6500+ vertical foot day. Ironically, more planning time and more time on the phone went into organizing this trip than any other in recent memory, and yet we ended up skiing something which we had not planned to do at all -- but it turned out great anyway! We left Paradise under cloudy skies much later than planned at almost 8am. Broke out above the cloud deck very quickly by 6000 ft, to cheers and whoops of joy. Got a good view of the Nisqually and Wilson Glaciers from Glacier Vista, with The Fan looking nasty to skin (full of avy debris) and the route to climber's right of the cliffs via Wilson Glacier looking better but still exposed to serac-fall hazard this year. The group decided they didn't really feel like ripping skins, skiing down to the glacier, and then skinning back up the other side via Wilson Glacier to reach the Turtle, so I suggested an alternate plan: go to Camp Muir instead and ski the Cowlitz Glacier down to its junction with Ingraham Glacier, a spectacular spot which is one of my favorite on the entire Mountain and which none of the others had ever been to. That sounded good to everyone, so we did an about-face and headed the other direction. The cloud deck thinning in dramatic fashion to reveal the Tatoosh Range and Mount Adams. Pan Face was still shaded at 9am and solidly frozen, so pretty much everyone was bootpacking up it. I decided to skin it anyway just for more practice in such icy conditions, using Jessie's 110-mm Dynafit crampons (thanks for the 20-minute loan!) on my 106-mm waist Dynafit Stokes. (I've not yet bought ski crampons for the Stokes, they're my powder touring setup, but pressed into spring-corn service this day due to the recent demise of my 88-mm waist K2 Baker Superlights.) Very sketchy skinning angling up across the Face on an icy surface scarred by innumerable frozen ski and boot tracks plus 2 glissade troughs, with traction at times provided solely by the ski crampon points and not much else. Much nicer skinning conditions after exiting off the Face onto the SW ridge and then from Pan Point on up, softened enough in the morning sun to not need ski crampons even on the steep rolls. I did not ask them to pose like that! 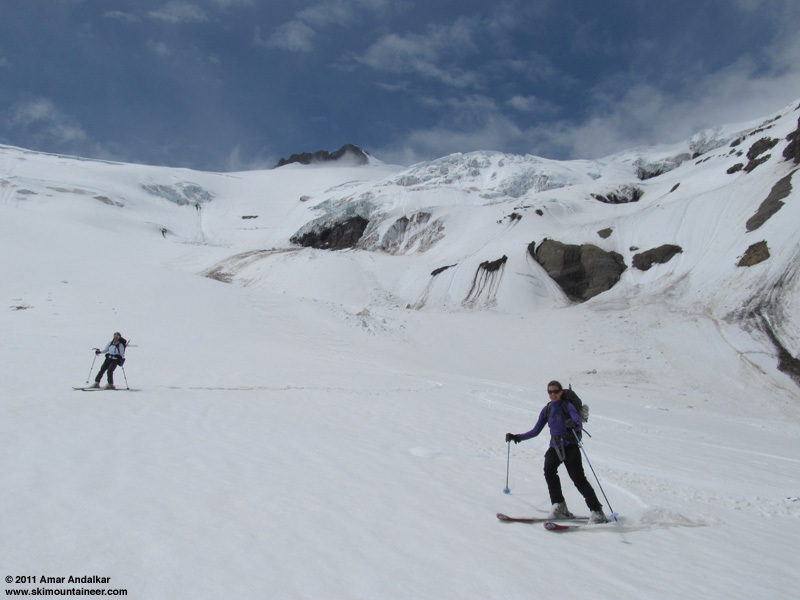 Lots of ski tracks on the Muir Snowfield, but the surface remained mostly smooth with large areas of firnspiegel. Bands of high clouds were moving by overhead after 11am, making things chilly at times when they would mask the sun, but then gloriously warm again in the nearly-calm air when full sun would return. The snow above 9000 ft was still fairly firm and not yet in prime shape for turns, with softening delayed further by the high clouds. Stephanie and kitty skinning up the Muir Snowfield. We reached Camp Muir just before noon in a 10 mph SW breeze, and took an hour-long lunch break in the lee of the ranger hut, waiting for the snow to soften some more. We skied down at 1pm and found ecstatic conditions: nearly perfectly-smooth untracked corn snow, softened just the right amount, much smoother and nicer ski conditions than the Muir Snowfield. 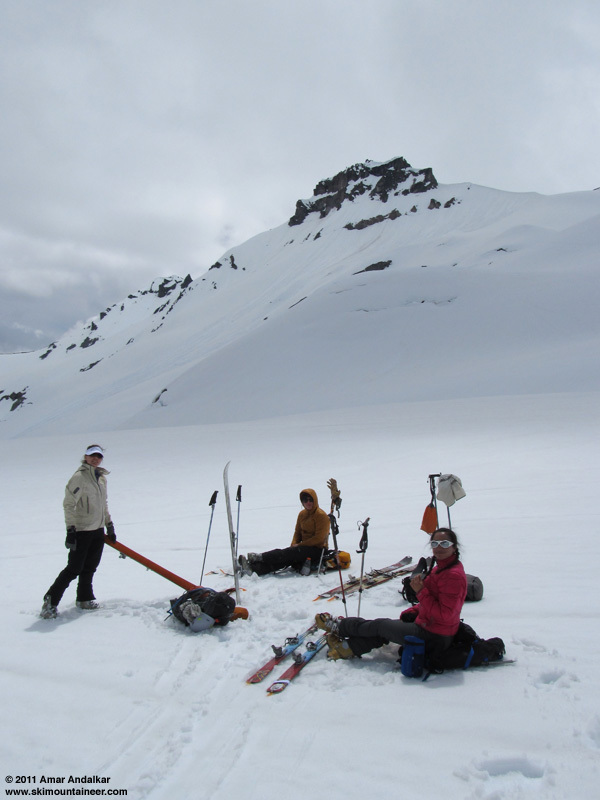 Carving the smooth corn on the Cowlitz Glacier. We carefully negotiated some crevasses and sags near 9500 ft, then traversed below a large group of seracs and below Anvil Rock. 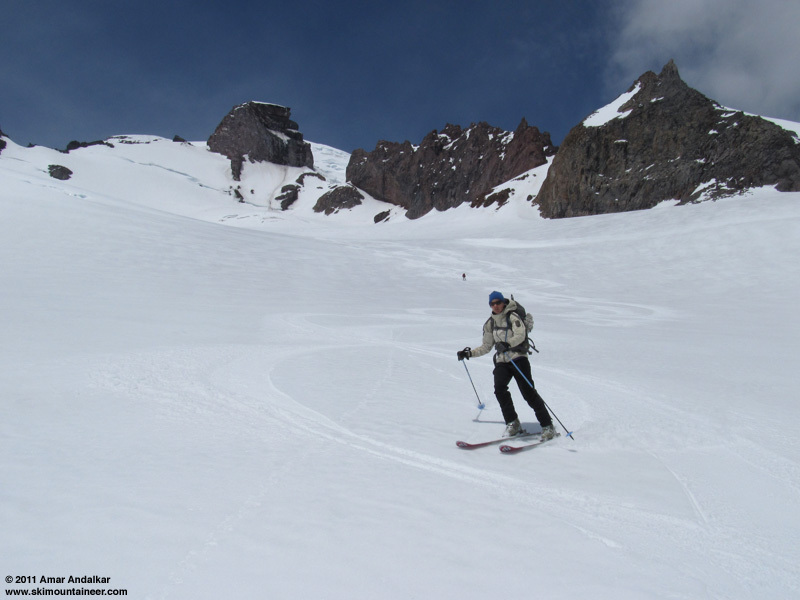 Skiing below seracs on the Cowlitz Glacier. Lots of crevasses on the glacier below us hindered any safe ski line directly down the Cowlitz Glacier from this point. We dropped across the bergschrund below Anvil Rock at its well-bridged NE end and then traversed south onto the edge of Paradise Glacier, which was smooth and uncrevassed. Three-shot panorama from near 9000 ft looking down the Cowlitz Glacier, with the adjoining Paradise Glacier at right. Cowlitz Rocks and the 7100 ft saddle are at right center. 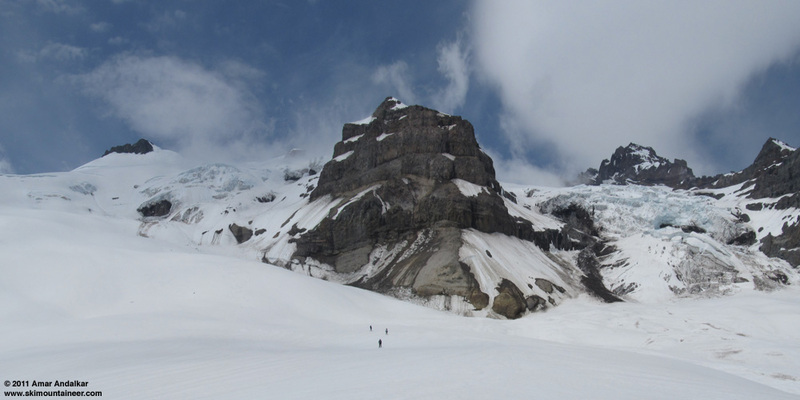 Near 8000 ft a very long crevasse is opening across the adjoining Cowlitz-Paradise Glaciers, extending perhaps a half-mile. 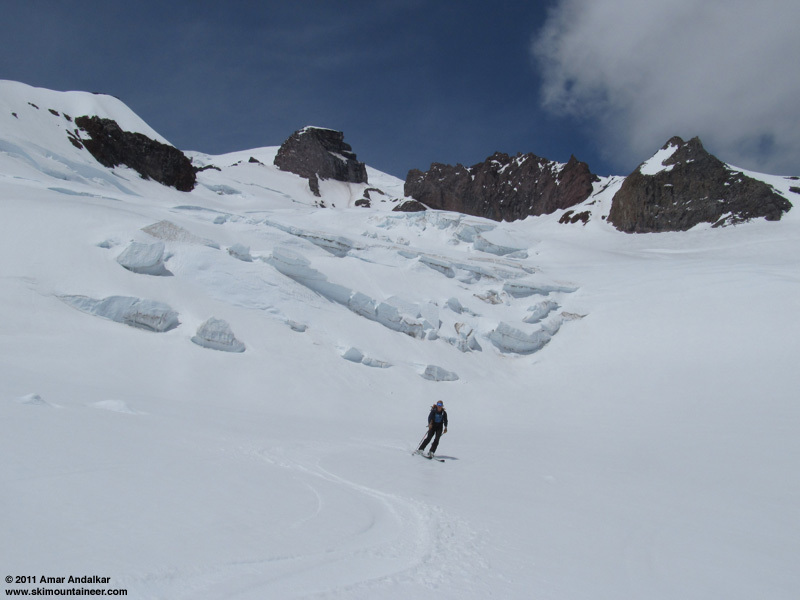 Older ski tracks led to a broad snowbridge across the crevasse, and while those tracks went right after crossing to stay on the Paradise Glacier, we cut left to rejoin the Cowlitz. We skied down the open uncrevassed slopes of the large bowl below the Cowlitz Icefall, with the snow softened a bit too much here, but still fun to ski. Skiing below the Cowlitz Icefall. Much sticker snow below 7000 ft, so we straight-lined it down to the flats and the medial moraine at the Cowlitz-Ingraham Glacier junction. I was awestruck as always by the grandeur of this arena, even though I'd been here only 3 weeks earlier (see May 24, 2011, Whitman Glacier via Cowlitz Rocks). Much more so for the others being their first time visiting this special spot (see first photo above). Rest stop on the Cowlitz Glacier, with Cowlitz Rocks overhead. 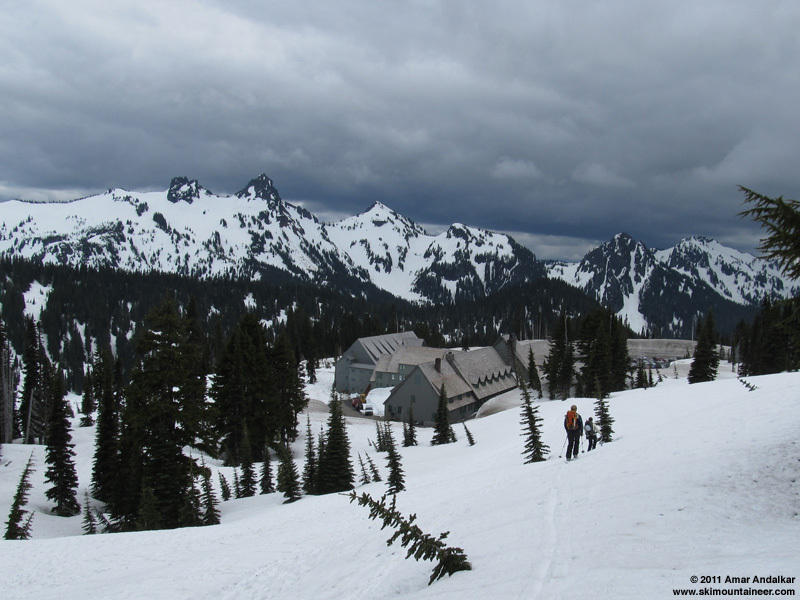 After a relaxed half-hour break in the warm sunshine, we began to skin back up to the Cowlitz Rocks saddle, just as the wind picked up and more ominous mid-level clouds began to move in from the southwest. Deep mushy snow on this northeast aspect, we followed traces of an older skin track in places and put in our own in others. We arrived at the saddle before 3pm to a moderate SW wind, 20-30 mph, a definite sign of incoming weather along with increasingly dark clouds above. The forecast had stated that precip was not expected until the next day, but evidence at hand indicated that the forecast was going to be wrong shortly. Climbing-skin bag makes a good wind sock at the Cowlitz Rocks saddle. We skied the valley of the vanished lower Paradise Glacier, then made a long traverse across numerous paths of old south-facing avy debris to eventually exit up through the cornice and over to Golden Gate, all doable without skins in the very soft and mushy snow. Skied out to Paradise by 4pm, happy to have enjoyed such a fine day of skiing and scenery despite our late change of plans. About 5700 ft of total vert for the day, including a lot of traversing on the exit, but well worth the effort for having skied down to such a spectacular spot. Best of all, within minutes of starting the drive back from Paradise, rain began to hit the windshield, pretty good timing to take full advantage of a weather window and not get wet. Beer, pizza, and salads (all very good) at Whittaker's BaseCamp Grill in Ashford capped off a very fun day. Thanks Khanh, Stephanie, and Jessie for the great company and good times all day. SYNOPSIS...WESTERLY FLOW ALOFT WILL PREVAIL ACROSS THE REGION TODAY. EXPECT A WEAK LOW PRESSURE SYSTEM TO AFFECT THE AREA ON MONDAY FOR A RISK OF SHOWERS. HIGH PRESSURE ALOFT WILL PREVAIL OVER THE REGION ON TUESDAY FOR DRY WEATHER. TODAY...MORNING CLOUDS THEN MOSTLY SUNNY. FREEZING LEVEL 9000 FEET. TONIGHT...INCREASING CLOUDS. FREEZING LEVEL 9000 FEET. MONDAY...MOSTLY CLOUDY WITH A CHANCE OF SHOWERS. SNOW LEVEL 7500 FEET. MONDAY NIGHT...MOSTLY CLOUDY. A CHANCE OF SHOWERS. SNOW LEVEL 8500 FEET. TUESDAY...PARTLY SUNNY. FREEZING LEVEL RISING TO 12000 FEET. TUESDAY NIGHT...MOSTLY CLOUDY. A CHANCE OF SHOWERS AFTER MIDNIGHT. SNOW LEVEL LOWERING TO 9500 FEET. WEDNESDAY THROUGH SATURDAY...MOSTLY CLOUDY WITH A CHANCE OF� SHOWERS. SNOW LEVEL 7500 FEET. 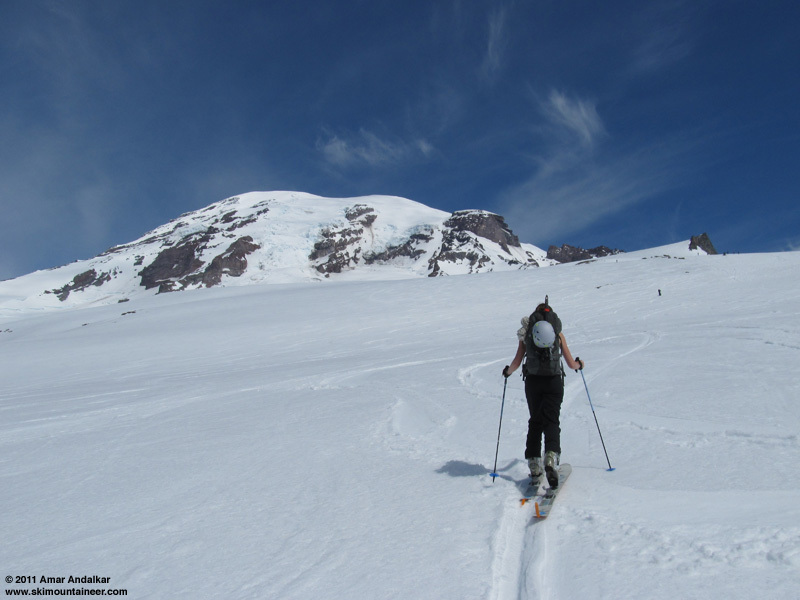 I thought you were supposed to ski the Muir snowfield from Camp Muir. Nice pano shots and lovely ladies ;-) You too Amar are, of course, beautiful. Thanks for the company and very thorough TR, Amar. It was a fun day! For those interested, such as Mr. Brown, Amar looked absolutely BEAUTIFUL all day long. We didn't take enough photos of him for personal, selfish reasons-- he's already got 3 of us girls hounding him to get out, and photographic evidence would surely steepen the competition for his priceless time and company. 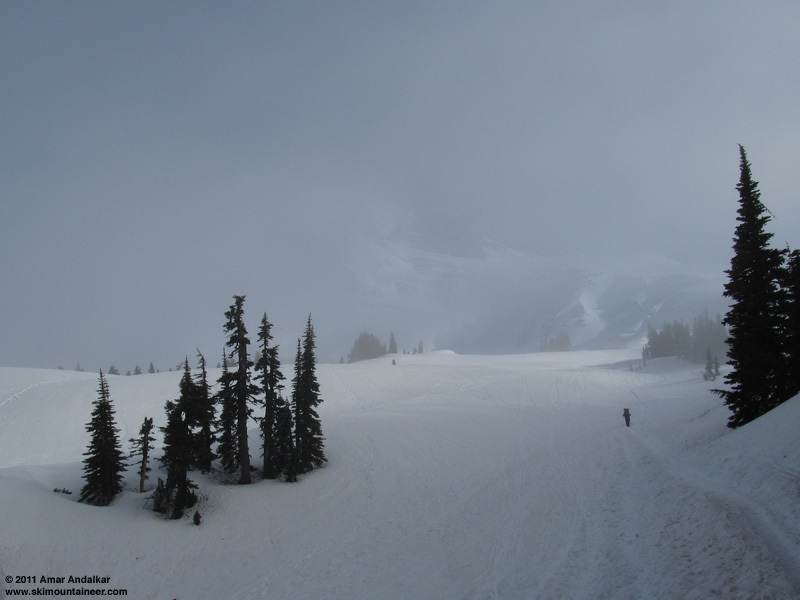 We skied out from Cowlitz saddle about a hour later in the rain. Was that one of your crew's water bottle bottle I found at Golden gate? Thanks back to you, Amar, for an unforgettable day! Qui ne risque rien, n'a rien. Nice day out ladies and Amar. Good to see you all smiling! As always, Amar, a stellar TR. reminded me of the "Crevasse Angels" poster that Jerry White did of Allyson, Cinnamon, and Monika a few years ago for the Glacier Travel class. Sounds like everyone had the timing down except Robie . . .